This figure is called "Origins" Wolverine, but they might as well have called him "Lumberjack Wolverine." He's wearing a plaid shirt with painted details that actually go all the way around the torso - it's nice that Art Asylum didn't skimp on the no doubt expensive apps for this figure. His face is very calm, and his whiskers are thick. He comes with two sets of hands: one with claws, one without. I wish he came with an axe, like the firefighters do. David North aka "Agent Zero" possesses sharpshooting abilities which guaranteed him a spot alongside Wolverine, Sabretooth and the others years ago - making him the perfect candidate to return Logan to the the team at any cost. I remember when the first trailers for the movie came out and we saw this non-descript Asian guy wearing a suit, I thought perhaps he was meant to be Jimmy Woo, leader of the Agents of Atlas. I certainly never would have guessed he was supposed to be this guy. The shape of the Minimate head, combined with the haircut and the expression on his face makes the figure look more like Agent Cho from The Mentalist than like actor Daniel Henny, but maybe I'm just a racist. 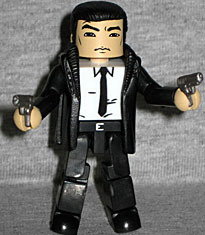 Or, hey, you can pretend it's a toy of Cheng Bo Sen, from the comic Gun Fu! Which actually makes sense, since gun-fu seems to be his superpower in the movie. The figure comes with two silver pistols, and is wearing a jacket with the collar turned up. Agent Zero is an unknown character with a very boring look, and Wolverine is another Wolverine. There's nothing bad about this set, but there's nothing that says you have to own it, either.